Dakar Universite Club are 2018 Cup winners! #1. This week's number one is an experienced international power forward Oumoul Sarr (185-84, currently plays in Spain). She could not help Gipuzkoa UPV (15-11) to beat AE Sedis (19-7). Sarr scored 7 points and grabbed 8 rebounds in 36 minutes on the court. Gipuzkoa UPV was edged 80-78 on the road by the higher-ranked (#3) AE Sedis. Sarr has relatively good stats this year: 10.6ppg, 5.5rpg, 3.1apg, 1.2spg, 2FGP: 53.5%, 3FGP: 18.2% and FT: 78.0% in 23 games she played so far. She is currently a member of the Senegalese senior national team. #2. Second place goes to an international forward Mame-Marie Sy-Diop (185-85, currently plays in France). Sy-Diop was not able to help Villeneuve D'Ascq in their game against Nantes Reze (13-13) in the French LFB. She recorded 8 points and blocked 3 blocks. Villeneuve D'Ascq was defeated 74-63 in Nantes by the lower-ranked Reze (#10). It was Villeneuve D'Ascq's fifth consecutive loss in a row. This season Sy-Diop averages: 7.3ppg, 4.4rpg, 1.4apg, 2FGP: 54.2% and FT: 82.1%. She has a dual citizenship: Senegalese and French. Sy-Diop is in the roster of the Senegalese senior national team. #3. The Senegalese player who performed third best last week abroad was former international power forward Marieme Diop (186, currently plays in Spain). She was the major contributor in a Gran Canaria's victory against the tenth-ranked Picken Claret (13-13) crushing them 91-71 in the Spanish LF2 (second division) last Saturday. Diop scored 14 points and grabbed 5 rebounds in 29 minutes. Spar Gran Canaria (10-19) is placed 15th in Group B. The Regular Season already ended. This year Diop's overall stats are: 7.3ppg, 4.4rpg, 1.4apg, 2FGP: 54.2% and FT: 82.1% in 21 games. She played for the Senegalese national team two years ago. #4. Center Ndeye Fatou (187-94, college: S.Nazarene, currently plays in Spain) is a teammate of previously mentioned Marieme Diop and both played together in the last Spanish LF2 game. Fatou contributed to an easy victory against the tenth-ranked Picken Claret (13-13) crushing them 91-71. She scored 10 points and grabbed 7 rebounds. It's Fatou's first season with the team. Fatou's total stats this year are: 7.3ppg, 4.4rpg and 1.4apg. She is also Senegalese national team player. #5. International guard Diodio Diouf (170-84, currently plays in Spain) is a teammate of previously mentioned Marieme Diop. She played also in the last Spanish LF2 game facing Ndeye Fatou (above) in the other team. Diouf contributed to an easy victory against the tenth-ranked Picken Claret (13-13) crushing them 91-71. She scored 8 points and grabbed 4 rebounds in 29 minutes. This year Diouf's total stats are: 7.3ppg, 4.4rpg and 1.4apg in 21 games. She plays currently for the Senegalese national team. #6. Center Mariame Dia (187-78, currently plays in France) managed to help Roche Vendee BC to win against the closely-ranked Flammes (13-9) 71-60 in the French LFB last Saturday. Dia scored only 3 points. Roche Vendee BC (12-10) is placed sixth in the LFB. It was her team's fourth consecutive victory in a row. Dia has been at the team for five years. She has averaged so far 5.3ppg and 3.1rpg. Dia is a former international player as she played for the Senegalese senior team six years ago. #7. Former international power forward Oumou Toure (190-88, agency: Octagon Europe, currently plays in France) led Reze to a 3-point victory over the closely-ranked COB Calais (7-15) 65-62 in the French LF2 (second division) in Saturday night's game. Toure was MVP of the game. She recorded a double-double by scoring 20 points and getting 11 rebounds. Basket Club Saint Paul Reze (10-12) is placed eighth in the LF2. They ended the series of three consecutive loses. There are only two games left until the end of the Regular Season. So now every game will be critical. Toure has individually a very good season with high stats. She averages: 16.6ppg, 7.8rpg and 1.3spg. Toure used to play for the Senegalese national team two years ago. #1. Astou Ndour (198-C-94, currently plays in Turkey) led Cukurova to a victory over the closely-ranked Ormanspor (19-9) crushing them 101-53 in the Turkish KBSL in Tuesday night's game. She was MVP of the game. Ndour had a double-double by scoring 21 points and getting 11 rebounds in 24 minutes. It was the game of the round between two top 4 ranked teams. Cukurova Basketbol Mersin (23-3) is placed first in the KBSL. Ndour has individually a very good year with high stats. She averages: 16.2ppg and 6.3rpg in 23 games she played so far. Ndour has a dual citizenship: Senegalese and Spanish. #2. Safy Fall (176-G-89, currently plays in Italy) was the main contributor in a 3-point Bolzano BK's victory against the tenth-ranked Carugate (11-17) 67-64 in the Italian Serie A2 (second division) last Saturday. She was MVP of the game. Fall recorded 27 points (!!!) and grabbed 6 rebounds. BK Itas Alperia Bolzano (13-15) is placed eighth in North group. There are only two games left until the end of the Regular Season. So now every game will be critical. It's Fall's fourth season with the team. She has relatively good stats this year: 14.9ppg, 4.8rpg, 1.8apg and 1.5spg. Fall is another player who holds two passports: Senegalese and Italian. #3. Experienced Mame Kanda Diop (185-F/C-0, currently plays in Switzerland). 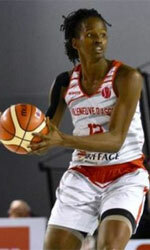 She could not help one of league's weakest teams Geneve Basket (11-7) to beat Winterthur (14-4). Diop cannot count Saturday's game as one of the best ones. She scored only 3 points in 15 minutes. Geneve Basket lost 69-74 on the road to the second-ranked Winterthur. Diop has averaged so far 2.8ppg and 2.8rpg in 19 games. She has both Senegalese and Swiss nationalities. Traditionally, every week we bring you a list of the top performances of Senegalese players who are currently playing abroad. #1. This week's number one is an experienced international forward Mame-Marie Sy-Diop (185-85, currently plays in France). She could not help Villeneuve D'Ascq (9-13) in their last game on Sunday. Despite Sy-Diop's very good performance Villeneuve D'Ascq was defeated 72-68 on the road by the higher-ranked Bourges (#3). She was the top scorer with 15 points. Sy-Diop also added 9 rebounds and made 2 blocks. There are only two games left until the end of the Regular Season. So now every game will be critical. This season Sy-Diop averages: 7.7ppg, 4.6rpg, 1.4apg, 2FGP: 55.4%(56-101), 3FGP: 17.4% and FT: 81.5%. She has a dual citizenship: Senegalese and French. Sy-Diop is currently a member of the Senegalese senior national team. #2. Second place goes to an international power forward Oumoul Sarr (185-84, currently plays in Spain). She contributed to an Gipuzkoa UPV's victory against the closely-ranked Gernika (17-8) 82-70 in the Spanish LFB on Saturday night. Sarr recorded 9 points, 4 rebounds and 3 assists in 28 minutes. IDK Gipuzkoa Universidad del Pais Vasco (14-11) is placed sixth in the LFB. Her team will play only one more game in the Regular Season. And now that game is very crucial. Sarr has relatively good stats this year: 10.7ppg, 5.4rpg, 3.4apg, 1.2spg, 2FGP: 55.9%(85-152), 3FGP: 16.7% and FT: 77.5% in 19 games she played so far. She is in the roster of the Senegalese senior national team. #3. The Senegalese player who performed third best last week abroad was an international center Ndeye Fatou (187-94, college: S.Nazarene, currently plays in Spain). Fatou was not able to help Gran Canaria (12-13) in their last game. Despite her good performance the ninth-placed Gran Canaria (12-13) was badly defeated 81-61 at home by the second-ranked Adelantados in the Group B. Fatou was the second best scorer with 14 points. She also added 7 rebounds in 38 minutes. It was Gran Canaria's third consecutive loss in a row. Fatou's team will play only one more game in the Regular Season. It's Fatou's first season with the team. This year she has relatively solid stats: 12.5ppg, 9.6rpg, 2FGP: 47.3%, 3FGP: 16.7% and FT: 76.5% in 25 games. Fatou is also a member of the Senegalese senior national team. #4. Power forward Marieme Diop (186, currently plays in Spain) is a teammate of previously mentioned Ndeye Fatou and both played together in the last Spanish LF2 game. Diop was not able to secure a victory for Gran Canaria (12-13) in their game against Adelantados (22-3). Despite her good performance on Saturday night She recorded a double-double by scoring 10 points and getting 12 rebounds. Diop's overall stats this season are: 9.4ppg and 8.6rpg. She used to play for the Senegalese national team back in 2017. #5. International guard Diodio Diouf (170-84, currently plays in Spain) is a teammate of previously mentioned Ndeye Fatou. She played also in the last Spanish LF2 game facing Marieme Diop (above) in the other team. Diouf couldn't help Gran Canaria (12-13) in their game against Adelantados (22-3). She scored 6 points in 34 minutes. Gran Canaria (#9) was badly defeated 81-61 on their home court in Las Palmas by the second-ranked Adelantados in the Group B. This year Diouf's overall stats are: 8.4ppg, 2.1rpg, 2.2apg and 1.2spg in 25 games. She plays currently for the Senegalese national team. #6. Shooting guard Oumoul Thiam (181-90, college: S.Nazarene, currently plays in Spain) is a teammate of previously mentioned Ndeye Fatou. She played also in the last Spanish LF2 game facing Diodio Diouf (above) in the other team. Thiam couldn't help Gran Canaria (12-13) in their game against Adelantados (22-3). She scored only 4 points. Gran Canaria (#9) was badly defeated 81-61 on their home court in Las Palmas by the second-ranked Adelantados in the Group B. Thiam's total stats this season are: 5.9ppg, 1.7rpg and 1.4apg. She is an international player who is currently on the senior Senegalese National Team roster. #7. International power forward Astou Traore (182-81, currently plays in Spain) couldn't help Maquinaria Ensino (3-22) in their game against Valencia (15-10) in the Spanish LFB. Traore recorded 5 points in 13 minutes. Maquinaria Ensino lost 52-57 on the opponent's court to the higher-ranked (#5) Valencia. It was Maquinaria Ensino's fifth consecutive loss in a row. Her team will play only one more game in the Regular Season. This year Traore's total stats are: 7.3ppg and 4.3rpg in 11 games. She is also Senegalese national team player. #8. Power forward Oumou Toure (190-88, agency: Octagon Europe, currently plays in France) couldn't help Reze (9-12) in their game against Nice (7-14) in the French LF2 (second division). Despite her very good performance on Saturday night Toure scored 20 points and grabbed 6 rebounds. Her team will play only one more game in the Regular Season. Toure has individually a very good season with high stats. She averages: 16.4ppg, 7.6rpg and 1.3spg. Toure used to play for the Senegalese national team back in 2017. #1. 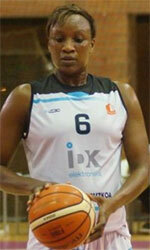 Astou Ndour (198-C-94, currently plays in Turkey) could not help Cukurova (23-2) in their last game. Despite her very good performance the league leader Cukurova lost 88-92 on the road to the lower-ranked (#7) Besiktas. Ndour scored 15 points and grabbed 8 rebounds in 31 minutes. Her team will play only one more game in the Regular Season. And that game will be critical. It's Ndour's first season with the team. Ndour has individually a very good year with high stats. She averages: 15.7ppg and 6.1rpg in 20 games she played so far. Ndour has a dual citizenship: Senegalese and Spanish. #2. Safy Fall (176-G-89, currently plays in Italy) led Bolzano BK to a 3-point victory over the 12th-ranked Albino (9-16) 62-59 in the Italian Serie A2 (second division) in Saturday night's game. Fall was MVP of the game. She recorded 22 points and grabbed 8 rebounds. BK Itas Alperia Bolzano (12-14) is placed eighth in North group. There are only four games left until the end of the Regular Season. So now every game is very crucial. It's Fall's fourth season with the team. This year Fall has relatively solid stats: 14.5ppg, 4.8rpg, 1.8apg and 1.5spg. She is another player who holds two passports: Senegalese and Italian. #3. Sokhna Ndiaye (194-C-95, currently plays in Spain) was not able to help Gran Canaria in their game against Adelantados (22-3) in the Spanish LF2 (second division). Ndiaye cannot count Saturday's game as one of the best ones. She scored only 2 points. Gran Canaria (#9) was badly defeated 81-61 at home by the second-ranked Adelantados in the Group B. It was Gran Canaria's third consecutive loss in a row. Ndiaye's team will play only one more game in the Regular Season. Ndiaye has averaged so far 3.0ppg and 5.0rpg. #4. Experienced Mame Kanda Diop (185-F/C-0, currently plays in Switzerland) led Geneve Basket to a victory against one of league's weakest teams Helios (4-13) 84-77 in the Swiss SBL last Saturday. She scored 11 points in only a mere 11 minutes. Geneve Basket Elite (11-7) is placed third in the SBL. It was her team's fifth consecutive victory in a row. The Regular Season already ended. Diop has averaged so far 3.0ppg and 2.8rpg in 16 games. She has both Senegalese and Swiss nationalities.